Background: The largest chemical producer in the world is comprised of subsidiaries and joint ventures in more than 80 countries, operating six integrated production sites and 390 other production sites in Europe, Asia, Australia, the Americas and Africa. At approximately 50 acres in size, with 11 main production facilities and around 600 employees, the site in Northern England is one of the most productive single site chemical plants in the UK and boasts an excellent safety and environmental record. The site switched over its production process for the monomer acrylamide to a modern enzyme-based process. Acrylamide is used for the production of water-soluble flocculation aids in wastewater treatment and papermaking, as well as mineral processing and enhanced oil recovery. The newer, biocatalytic production method results in less waste than the copper catalysis previously used. The process takes place at room temperature and under normal atmospheric conditions, resulting in energy savings, greater environmental compatibility and fewer by-products. Objective: Acrylamide is identified as a hazardous substance, the possibility of inadvertent ingestion, inhalation and direct skin or eye contact must be minimized. It was imperative that any accidental exposure to acrylamide could be dealt with immediately. The eyes and face are the most sensitive part of the body exposed to external threats from chemical processes, as such it was imperative to ensure the safety of those working closely with the bio-acrylamide production process. In addition to the workforce adopting the correct PPE, the availability of emergency eye/face wash equipment should be located immediately adjacent to the potential hazard. Solution: Hughes specified the STD-45G Emergency Eye/Face Wash. With its closed ABS bowl, the STD-45G is protected from dust and debris ensuring the bowl remains clean and free from contaminants at all times. The tough, durable acrylic capped ABS construction is both corrosion and UV resistant. Ease of use is essential in an emergency, the lid of the eye/face wash connects to the water valve for automatic operation when the lid is pulled down. The aerated eye wash diffusers ensure a high flow rate irrigation with a soft scrubbing action that prevents further injury to the eyes. For a thorough flush of the eyes following contact with acrylamide the unit is able to deliver 11.4 litres of flushing fluid per minute for at least 15 minutes. 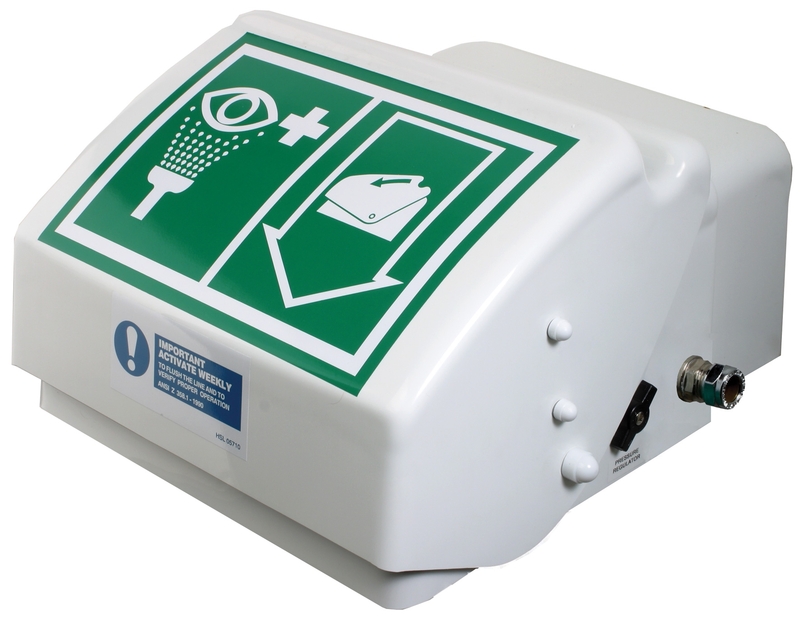 The large pictogram signs on the front of the STD-45G ensure greater visibility and instructions for use, essential in a busy chemical manufacturing environment. If you have exacting requirements for your site, please contact our team to discuss your needs in detail using the web contact form, Tel: +44 (0)161 430 6618 or Email: sales@hughes-safety.com. Download the PDF version of the full article.